I stumbled upon these cute pumpkin rolls just very recently and was sold immediately. Maybe you are sold, too? I find them just too cute. And super perfect for breakfast or Thanksgiving for that matter. These are real pumpkin rolls made with yeast dough. 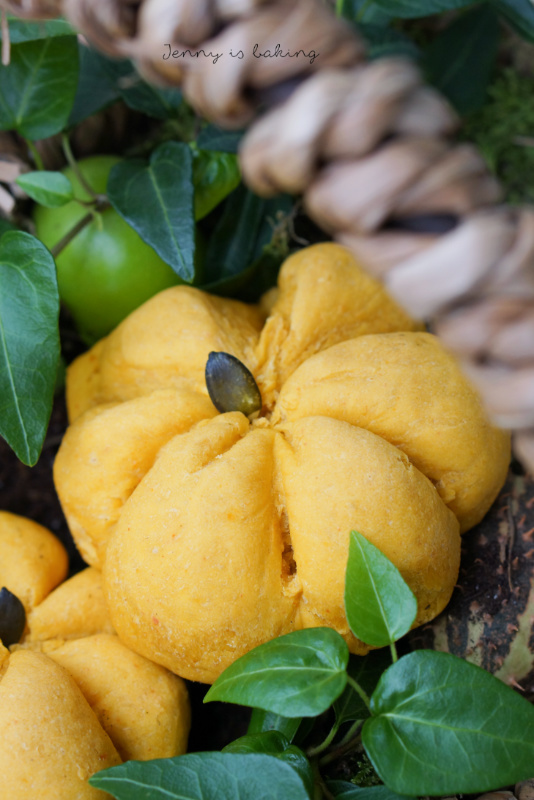 Yes, they do look like a pumpkin, an eatable pumpkin and yes, they have pumpkin inside of them. They also happen to be vegan. The only tricky part for me was getting off the yarn. First I was too impatient and wanted to do it while they were still warm. That was a mistake. However, you also can’t wait too long as otherwise the yarn will stick to the rolls. I was first a bit scared as you need to pull strongly. The trick is to pulling it out strongly at a place where a possible crack is not as visible. If you look very closely at my pictures, you will see the tiny holes where I pulled the yarn. I feel that makes the pumpkins look even more authentic, don’t you think? The rolls are moist and fluffy, exactly the way I like it. My husband and me had them for breakfast, happily spreading peanut butter and jam or cream cheese on. You can obviously also make a fancy butter, cinnamon or ginger comes to mind. Especially if you plan to make these for Thanksgiving. I increased the amount of pumpkin used in this recipe for a really light texture and a stronger color as I don’t like artifical food coloring. I don’t like my rolls to be too dense either. Making the rolls is not that hard, most of the work is done by the yeast. I found getting off the yarn to be the trickiest. But don’t worry, if you do it at the right time, the rolls will come out really great. PS: Of course you don’t have to go through the hassle with the yarn and tying them. If you just roll them into balls, you will have equally delicious pumpkin rolls. Dissolve yeast in water and add molasses. Let stand for about ten minutes. Stir in pumpkin puree, then add flour and salt. Knead for about ten minutes with your hands, dough will be sticky. Try not to add too much flour as otherwise the dough will become dense. Cover bowl with tea-towel and let rise for about an hour or until double in volume. I usually heat oven to 70 degrees Celsius, turn it off and put the bowl inside with the door closed. Knead dough shortly again and form into 12 balls. Tie three strings of yarn around. How this is done, is shown here nicely. Place six balls on each baking sheet lined with parchment paper and cover with towel to rise for about 20min again. Preheat oven to 170 degrees Celsius. Before you take out the yarn, let rolls cool off a bit, about 20min. However, don’t wait too longer either as the yarn will stick to the rolls. Unknot the yarn and pull each string at a place that is not as easy to see (for example the bottom of the roll). Decorate with one pumpkin seed as the stem for each roll. Enjoy! As always, I am taking this to the link party Fiesta Friday. They’re just the most adorable rolls I’ve ever seen in my life! I MUST make them! 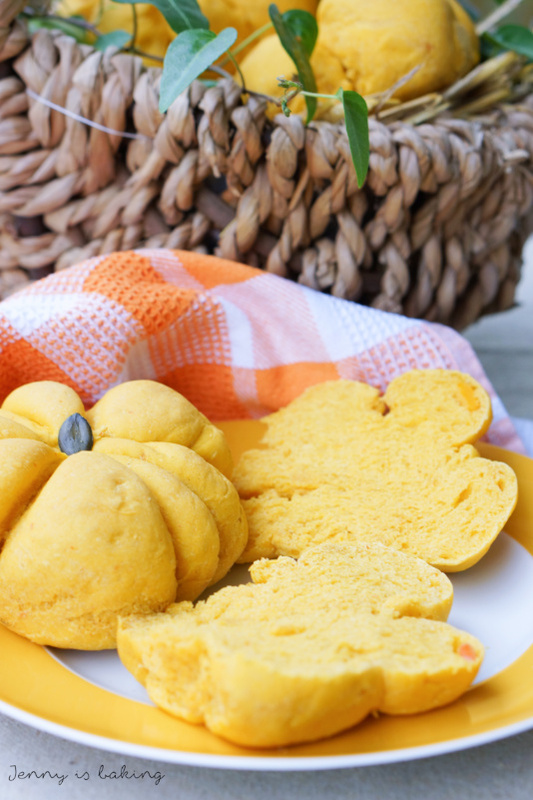 Wow, I love the seasonally inspired shape and how easy this recipe really is! Brilliant! I might give it a go next weekend 🙂 Thanks for sharing! You are welcome! Tell me how they turned out! These are just awesome and I bet they are perfect for breakfast! I think I might have to take your shortcut, and make them into rolls, and skip the yarn! Although, they are really beautiful this way! Thank you for bringing your adorable and delicious seasonal rolls to Fiesta Friday this week! Happy Fiesta Friday! Ahhhh, these are too adorable to eat! 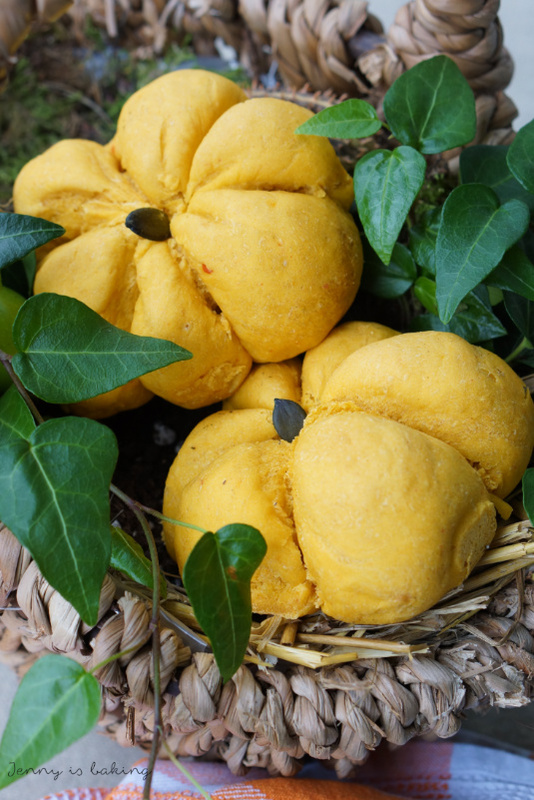 I have been seeing such cute pumpkins without knowing that they are pumpkin rolls – how awesome! Thanks for sharing these lovely rolls, Jenny! Happy Fiesta Friday!